2. The ………………. Established in 1958 has been playing an important role in the development of cooperative marketing in India. 3. The …………………..implemented the “Operation Flood Programme”. 1. The memorable phrase ‘each for all and all for each’ was coined when the ………. was formed with the membership of poor people for poor farmers and artisans. 2. ………………..in Frankfurt is now the largest single retail organization in the Coop Group in Germany. 3. ………………..is now the second retail organization in the Coop Group in Germany. 4. ………………..in Kiel is now the third largest organization which accounts for 8% of overall coop business in Germany. 5. ……………,who contributed the maximum to the spread of the cooperative movement in Germany, was the Mayor of Weyerbusch. 6. …………. was a German who organized cooperative societies for providing credit to big farmers. 7. ……………..contributed the maximum to the spread of the cooperative movement in Germany. 8. ………………organized a ‘Poor People’s Committee’ which provided food to the poor and reovered the loan after the expiry of the specific period. 9. A new society where poor people were members of the society was constituted by ……………., under the name of ‘Heddesdorf Credit Union,’ to give credit to deserving farmers and artisans for productive purposes. 10. The trade unions and cooperatives jointly entered the life insurance field and …………… was founded before the First World war to provide better and cheap insurance cover to the poor. 6. The Madras Government sent……………….for studying the cooperative movements in European countries. 7. In …………….the National Cooperative Development Corporation(NCDC) was established for strengthening the cooperative activities. 9. In the ……………….five year plan the All India Rural Credit Review Committee was set up. 10. In 1970 the Reserve bank of India set up the ………………for the review of rural credit system. 4.. . ……………..is based on the principle of self interest, maximization of profits and exploitation. 5.. …………is based on the principle of self-help through mutual help, abolition of profits and service above self help. 6. In ……………….form of business organization profit earning is the fundamental motive. 7. In…………….. each works for all and all work for each. freedom occupies the front position. movement does not accept State interference. 1. By which fundamental right other fundamental rights is protected? 2.Which of the following is not a fundamental right? 3. 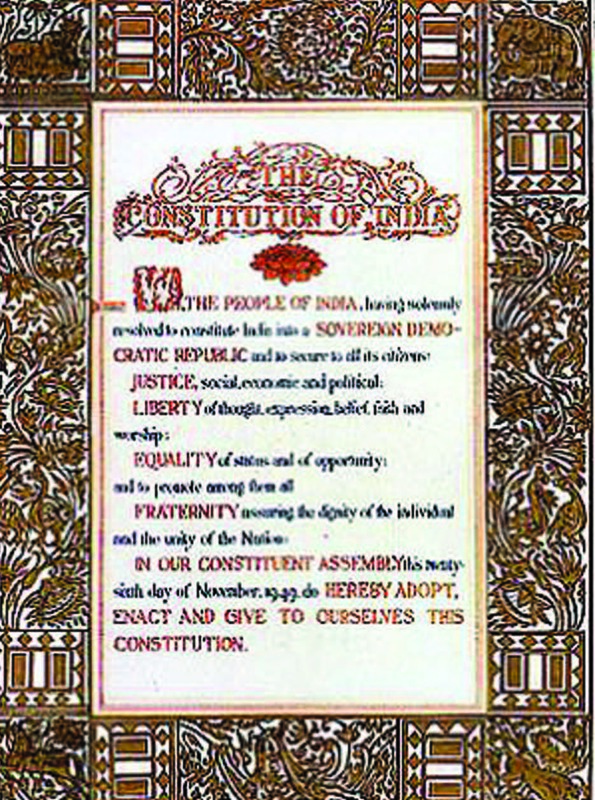 Which of the following has ceased to be a fundamental right in the Indian Constitution? 7. Which was described by Dr. B. R. Ambedkar as the ‘Heart and Soul of the Constitution’?